The KTM 390 Adventure continues to undergo pre-production tests as another mule of the upcoming motorcycle was spotted in India. This camouflaged test mule of the upcoming KTM 390 Adventure reveals the mounts for the panniers and the top box. Previously, the motorcycle was spied with panniers and top box – optional accessories that would be available as sold as Powerparts through the dealerships. The new photographs do not see the optional luggage accessories. However, the test mule revealed the mounts for the hard panniers and the top box. The mounts would also act as saddle stays if the rider opts for soft panniers and prevent saddlebags from getting in touch with the rear tyre. Rest of the hardware is identical to the test mules that we have seen in the past. 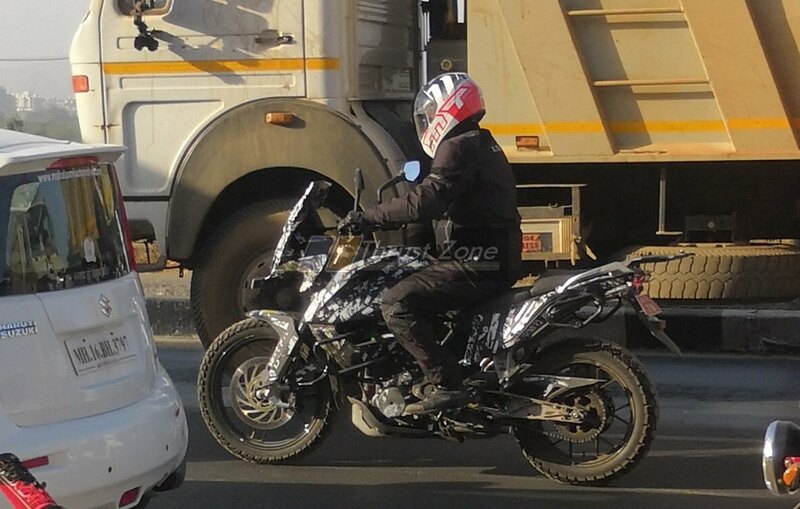 The motorcycle was spotted with alloy wheels yet again. Regular readers would remember that the test mules spotted in Europe featured wire-spoke wheels. The Austrian brand is expected to introduce the model in two options – 390 Adventure and the 390 Adventure R.
The base variant would be road focused and would come equipped with alloy wheels and a fibre engine cowl. The more premium, R badge model, on the other hand, would use wire-spoke wheels and a metal bash-plate for better protection on the trails. Both motorcycles would feature a 19-inch front wheel that would be targeted to offer a balance between on- and off-road handling. The recently spied test mule, similar to previous sightings, was seen with dual-purpose, knobby tyres. The 390 Adventure duo would be built around a trellis frame with a bolted sub-frame – a feature that we have already seen on the 390 Duke (2017 onwards). The feature list would include full LED lighting (headlight, tail lamp and blinkers). The motorcycle would come with a windscreen to offer protection against windblasts while the optional Powerparts could include a taller wind deflector. The motorcycle would receive full-digital display with smartphone integration via Bluetooth. The adventure tourer could also benefit from a turn-by-turn navigation system. 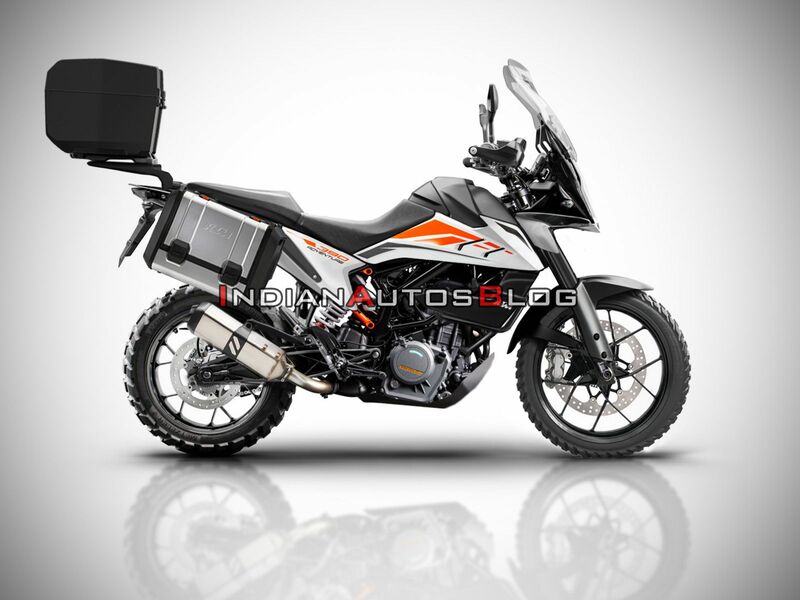 IAB's render of the upcoming KTM 390 Adventure imagines the luggage solutions that KTM would offer. The panniers and a top box would be sold as Powerparts through KTM outlets. Mechanical specifications would include a 373.2cc, single-cylinder, DOHC, 4-Valve, liquid-cooled motor. The powertrain delivers 43.5 hp of max power at 9,500 rpm and 35 Nm of peak torque at 7,250 rpm on the 390 Duke naked roadster. The engine mapping and the gear ratio might get a revision for a better low-end grunt on the adventure tourer. The source of the photograph claims that the motorcycle could arrive by May 2019.